Mari-Lynn Evans and Jordan Freeman of Evening Star Productions have produced a new movie called Blood on the Mountain. [TRIANGLE, VA.] The United States Bankruptcy Appellate Panel for the Eighth Circuit today reversed a decision by federal Bankruptcy Judge Kathy Surratt-States that would have allowed Peabody Energy to stop paying health care benefits for some 3,100 retirees that it had assumed in the spinoff of Patriot Coal. The strongly-worded decision by the three-Judge panel means that Peabody continues to hold responsibility for paying the health care benefits for this group of retirees, who are mostly in the Midwest. “This is a bright ray of good news in what has been a long, dreary period for the retirees, their dependents and widows who have been desperately worried about what’s going to happen to their health care,” UMWA International President Cecil E. Roberts said. In preparation for the spinoff of Patriot, Peabody signed a 2007 agreement with Heritage Coal Co., which was at the time a Peabody subsidiary that Peabody included in the Patriot spinoff. That agreement allowed Peabody to reduce its contribution levels for retiree health care benefits to the same level as Heritage (Patriot) would pay if such levels were modified in the future. Peabody argued that since Heritage (Patriot) was relieved of all its obligation to pay for retiree health care by Judge Surratt-States, that Peabody should be relieved of its obligation as well. Judge Surratt-States agreed, and issued a ruling in Peabody’s favor on May 29. Patriot and Heritage appealed, and their appeal was supported by the UMWA. As the United Mine Workers of America protested in Fairmont, West Virginia’s representatives in Washington wanted to let them know they were standing behind them. The rally brought in more than 25 buses filled with UMWA miners protesting the cuts to benefits and pay as a result of Patriot Coal’s bankruptcy. Negotiation attempts between the UMWA and Patriot have not yet been completed to the satisfaction of both parties, though a bankruptcy judge recently ruled Patriot Coal could proceed with its plan to escape bankruptcy. The UMWA asserts that Patriot Coal was spun-off from its progenitor company Peabody Coal with the intention to fail. The union also levies some responsibility on Arch Coal, which sold a number of its assets that were later purchased by Patriot Coal. Coal is just the first step in the Obama administration’s plan to tackle global warming, according to an industry group. “Even though right now [Obama] says the EPA should focus on the utility industry, we all know that other segments, including the refining industry, are well in the cue,” said Charles Drevna, president of the American Fuel and Petrochemical Manufacturers, which represents with refining industry. The president’s plan to address global warming largely relies on executive actions to reduce U.S. carbon emissions, including setting emissions limits for new and existing power plants that would effectively ban the construction of new coal-fired power plants. The refining industry joins a growing number of industries that are fighting back against the president’s proposed plan to fight global warming. Three years ago, 29 miners died at the Massey Energy Upper Big Branch mine. It was the worst mining disaster in decades, caused by a methane-fueled blast that was so strong it killed miners more than a mile away and left steel rail lines tangled. Appalachia has seen its share of these sorts of accidents over the years and normally companies get fined, but mine operators almost never face criminal charges. This time was different. For the past two years, the U.S. Attorney in West Virginia, R. Booth Goodwin II, has been systematically working his way up Massey’s hierarchy, arguing that beyond the managers who supervised that mine, there was a broader conspiracy led by still unnamed “directors, officers, and agents.” Goodwin has based his prosecutions on conspiracy charges rather than on violations of specific health and safety regulations, which means he can reach further up into the corporate structure. So far, he has convicted four employees including the Upper Big Branch mine superintendent who admitted he disabled a methane monitor and falsified mine records. But in February, the case took a surprising turn. In pleading guilty to conspiracy charges, Dave Hughart, former President of a Massey subsidiary who is cooperating with the government, said that the person who had alerted him to impending mine inspections was Massey’s CEO, Don Blankenship — an accusation that sent a gasp through the entire coal industry. Mine explosions have become increasingly rare in the U.S. as tighter federal oversight and better methane detection and ventilation systems were adopted. The disaster at the Upper Big Branch was labeled “entirely preventable” by the federal Mine Safety and Health Administration, which investigated the accident. Amid public pressure, Blankenship retired in 2010, losing control of the company he ran for 28 years. He walked away with a retirement package worth over $80 million and many felt justice was never done. In late April, Goodwin filed papers saying his criminal investigation is not yet finished. It is anyone’s guess whether Goodwin will actually bring criminal charges against Blankenship. But the case is best understood for what it says more generally about coal’s changing fate in West Virginia. It also highlights the epic career arc of this half century’s biggest coal baron. Over the past two decades, Blankenship has had an unprecedented impact on every aspect of West Virginia — its economy, its courts, its media and its politics. As the CEO of an energy company that at its height controlled over a third of the remaining coal seams in the region and had more mountaintop removal mines than any other Appalachian company, Don Blankenship wielded enormous influence over the state and its politics. He ran Massey Energy like a private fiefdom. Many of the mine offices had DAD’S cups that, according to court documents, stood not for the old-time root beer but “Do As Don Says.” Company calendars listed the keystone events in both American and Massey history, noting for example that on December 28, Woodrow Wilson was born in 1856, and in 1984 there were “eleven shots fired into Don L. Blankenship’s office at Rawl Sales” during a historic strike. Blankenship worked aggressively to make sure things went his way where state politics were concerned. He spent $3 million in 2004 electing a conservative state supreme court justice who later voted Massey’s way in a crucial case, saving Blankenship’s company $70 million. This case, Caperton v. A. T. Massey Coal Co., raised thorny questions that were ultimately taken to the U.S. Supreme Court. Blankenship also dealt then-Governor Joe Manchin one of his most painful political setbacks, spending hundreds of thousands of dollars funding a campaign that successfully convinced voters to turn down a massive bond plan. In beating a major strike in 1984-85, then pursuing over the next decades an adamantly anti-union policy, Blankenship is widely credited with having been the man who undercut the United Mine Workers in a state where this union had, for the past half century, held strong. Blankenship’s success in defeating the UMW led in part to his being named the new head of Massey five years later. And yet, in the space of two short years, Blankenship has lost the empire he worked most of his life to build. In the aftermath of the Upper Big Branch disaster, he was pushed into early retirement. His money is no longer courted to finance the state’s long-shot Republican candidates. Massey’s sale to Alpha Natural Resources was finalized in the summer of 2011. Quietly, the proud son of West Virginia moved outside the state last year, now spending most of his time in Tennessee. In implicating Massey’s CEO as the person for a decade had directed him to hide safety violations from inspectors, Hughart was the first person in the industry to strike out publicly against Blankenship–even if he didn’t dare say his name. Until now, many West Virginians have been afraid to speak out against Blankenship, fearful for their jobs, their teaching positions or their political office. But Hughart’s words were the culmination of a process that had brought the state and its people to a turning point. Never before have the consequences of an accident been so severe that they forced the resignation of a three-decade chairman and the sale of the company. Never before has an official investigation into a mining disaster moved beyond the minutiae to examine a corporate culture that was an incubator for accidents. Never before has the U.S. attorney in a mining disaster systematically pursued the highest perpetrators of the tragedy, refusing to settle for a few wrist slaps at underlings. Mr. Goodwin’s pursuit of the Upper Big Branch case comes at an especially transformative moment for the coal industry more generally. Coal has never been so embattled. At its height, coal provided more than 50 percent of America’s electricity. Now it’s about a third and lessening every year. There are already tighter regulations on mercury emissions and new rules on the disposal of coal mine waste, all of which add to costs for coal companies. And West Virginia operators like the former Massey Energy must also compete with massive strip-mined operations in places like Montana which already mines three times as much coal as the Mountain State. Things will likely get even tougher for the coal industry. Regulations on valley fills are pending, which could make mountaintop removal projects in Appalachia vastly more difficult for companies to pursue. Obama has called for an “all of the above” energy strategy that includes a reliance on “clean coal” – an idea that has been debunked repeatedly – but has also talked increasingly about the need to address climate change. For Blankenship, the wane of the coal industry and its dwindling political sway could not come at a worse time. He now faces the possibility of criminal charges in a state where for decades, a prosecution of a coal baron would have been unthinkable. Rumors are swirling that Blankenship could be indicted soon, possibly within the next couple of months. If so, a West Virginia jury could decide whether Blankenship, who so closely managed his company’s operations, will be held criminally responsible for the 29 deaths in the Upper Big Branch mine. Blankenship has recently made a few attempts to re-enter the public eye. On his twitter account, which fell silent in 2010, he’s resumed posting about politics and mine safety. “MSHA is the problem, not the solution,” he wrote in March, referring to the Mine Safety and Health Administration. His personal website features an entire “Mine Safety” section, recently updated, where he rails about the agency. And he’s tied to a new site named “Save the Country,” where climate change deniers like Christopher Monckton are allowed to air their — broadly discredited — views. The Upper Big Branch disaster, and his possible prosection, continue to cast a long shadow over any designs by Blankenship at a come-back. “Most of the candidates don’t want contributions from me because it gets too much negative publicity,” he told the Wall Street Journal in November. With or without Blankenship, the coal industry faces broad troubles. Are Union Leaders Richard Trumka and Cecil Roberts Murderers? As Don Blankenship faces a likely federal indictment, the former CEO of coal giant Massey Energy is flailing out on his website against his enemies. He has accused the leadership of the United Mine Workers of possibly hiring a contract killer who murdered a strike breaking coal truck driver in 1985. The president of the UMWA then was Richard Trumka, the current president of the AFL-CIO. One of his lieutenants was Cecil Roberts, now the president of the UMWA. “There’s not a word of truth to anything Blankenship said,” says a UMWA spokesperson. “Our lawyers our looking to see if this is actionable.” The AFL-CIO has not replied to my request for a comment from Trumka. I tell the story of the strike in my book: The Price of Justice: A True Story of Greed and Corruption, which documents the fourteen-year struggle of two Pittsburgh lawyers, Dave Fawcett and Bruce Stanley, to bring Blankenship to justice. In those years Stanley was a young reporter for the Williamson Gazette, in the heart of coal country. The 1984-85 strike was not only the longest in UMWA history, but also one of the most significant strikes in American labor history. The UMWA lost signaling the beginning of the end of the militant union as the most powerful political force in the region. The UMWA these days is largely a union of retirees and disabled. It was Don Blankenship, then the young president of a Massey subsidiary, who won the strike and pushed the union into decline. As a young college man, Blankenship worked summers as a union miner and spent a whole year earning enough to go back to college. He understood the miners and the seemingly inevitable trajectory of UMW strikes. They typically started with marchers and cheers but sooner or later there was violence, and whoever was blamed usually lost the strike. Blankenship’s lifelong friend, Elliott Maynard, then a circuit judge, ruled that the union could not march or have a full range of pickets. That’s when a few desperate miners turned to violence, burning a building. When Hayes West, a strikebreaking truck driver, was shot to death and another man wounded, the UMWA called a halt to the fifteen-month strike. Trumka was hoping to create a new kind of union in which there was no longer the threat of violence, and West’s death was a blow to him and to his union. Trumka was an ambitious, smart man and it was unthinkable that he or other UMWA leaders would hire a contract killer as Blankenship suggests may have happened. I have spent the past two and a half years writing a book about how two Pittsburgh lawyers, Dave Fawcett and Bruce Stanley, spent fourteen years trying to bring Blankenship to justice. In its review of The Price of Justice, Publishers Weekly said that Blankenship is “a villain for the ages,” and so he is. He was a poor West Virginia boy who could have done so much good. He chose a different route although he is convinced he is a heroic figure fighting the evils of the union, government regulation and compromising politicians. Blankenship’s three-page rant encapsulates the tragic trajectory of coal country set in place largely by Blankenship. It is a paranoid document blaming misguided, often evil outsiders of destroying the most important industry in the region. He blames Obama, federal safety regulators and environmentalists for decimating the coal business. The reality is that the coal industry in Appalachia is declining largely because after 140 years most of the large, easily accessed seams have been mined out, and newly discovered natural gas has a large price advantage. Blankenship will have none of that, and over the last three decades has been more responsible than anyone else in creating a self-pitying paranoia and an almost crazed fear of outsiders. This attitude has prevented the region from looking at alternatives to a dying industry. If nothing happens, within twenty years the Appalachian highlands will be like the frontier provinces of Pakistan, home to a dying, deprived people where almost nobody dares to go and even government walks carefully. But there is hope and that hope begins with the criminal prosecution of Blankenship. US Attorney Booth Goodwin has done a systematic investigation, working up from the lower level employers, convicting one after another of misconduct that helped lead to the deaths of 29 miners at Upper Big Branch in 2010. Goodwin stands now before Blankenship’s door, and by all indications he is not walking away. And Blankenship seems to know it. “If they put me behind bars…it will be political,” Blankenship asserts. The knock will likely come in the next few weeks, and with it the possibility of a new kind of future for coal country. If it does the two heroes of my book, Bruce Stanley and Dave Fawcett, will deserve part of the credit along with an independent, fearless US Attorney and his tireless staff. In a major step forward in stopping the blasting of mountaintops to get to coal, a federal court unanimously upheld the Environmental Protection Agency’s (EPA) authority to veto these projects under the Clean Water Act. 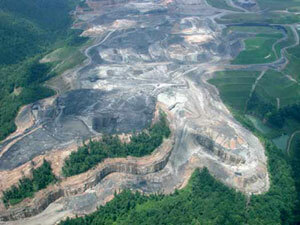 In 2011, EPA, for the first time, revoked a permit for mountaintop removal. It was for Spruce Mine, the biggest, most destructive project proposed to date. The permit would have allowed Arch Coal to destroy 3000 acres of mountaintops and allow the toxic waste to flow into six miles of pristine mountain streams. The Army Corps of Engineers approved the permit in 2007 and the EPA revoked it because the mine would cause unacceptable damage to rivers, wildlife and communities in West Virginia. Yesterday, the federal Court of Appeals in Washington DC upheld the EPA’s right to veto that permit, reversing the lower court’s contrary ruling – a major blow to the coal industry. Appalachian citizen groups have been fighting the coal company and the state of West Virginia against the Spruce Mine for over a decade. “The U.S. Army Corps of Engineers has literally overseen the destruction of Central Appalachia, and EPA oversight is needed to stop it,” says Joe Lovett of Appalachian Mountain Advocates. “Now, we just need EPA to take action to protect more communities and mountain streams before they are gone for good,” says Emma Cheuse, an Earthjustice attorney. Not so fast say West Virginia representatives who plan to continue the court process as well as introduce legislation to block EPA’s rights. The “Clean Water Cooperative Federalism Act” would “prevent the EPA from using the guise of clean water as a means to disrupt coal mining,” says Rep. Nick Rahall (D-W.VA). The coal industry, some utilities and their congressional allies contend the EPA is trying to kill the industry. “A cloud of uncertainty now hangs over any project and companies will no longer have the assurance required to encourage investments, grow our economy and create U.S. jobs,” Hal Quinn, CEO of the National Mining Association told the LA Times. Mountaintop-removal coal mining has destroyed over 500 mountains, a million acres of forest and 2,000 miles of streams in Appalachia. Pollution from mountaintop-removal mining has been found to cause deformities and reproductive failure in downstream wildlife and has been associated with cancer clusters in nearby communities. Earthjustice, along with Appalachian Mountain Advocates, is representing West Virginia Highlands Conservancy, Ohio Valley Environmental Coalition, Coal River Mountain Watch, Sierra Club, and Natural Resources Defense Council as amici curiae (“friends of the court”) in support of EPA’s veto in this case. Why do coal companies like mountaintop removal so much? It’s cheaper than underground mining and requires fewer people to do the work. During the Bush Administration, the already loose regulations were loosened even more, allowing coal companies to simply dump the debris right into the rivers below. “50 years ago there were 151,000 coal miners in West Virginia and today there are 15,000 and yet the coal coming out each year has soared in that period of time,” Robert Kennedy Jr says. While mountaintop removal mining supplies less than 5-7% of national coal production, millions of pounds of explosives are detonated every day in West Virginia, Kentucky, southwest Virginia and eastern Tennessee. Patriot Coal agreed to stop the practice last year. United Mine Workers march on Patriot Coal in Charleston over proposal to cut employee and retiree health benefits. CHARLESTON, W.Va. — An estimated 6,000 to 10,000 union members and supporters rallied at the Charleston Civic Center on Monday, then marched a few blocks to Patriot Coal’s state headquarters, to protest a proposal from the company to cut employee and retiree health benefits. Sixteen people were arrested at the end of the peaceful demonstration, including United Mine Workers of America President Cecil Roberts. The mass of people, many clad in the unofficial union camouflage uniform and chanting slogans, left the Civic Center just after 11:30 a.m., following a morning rally. “Patriot promised! Patriot lied!” was one of the recurring slogans chanted by the protesters as they snaked their way from the Civic Center to Virginia Street, up Virginia Street to Court Street and down Court Street to Laidley Tower, where Patriot has local offices. The chant alternated with cries of “We are union!” and “UMWA!” Although several labor unions were represented at the rally and march, with participants coming in from several states, many were West Virginia coal miners. Last month, Patriot Coal asked a federal bankruptcy judge to throw out the terms of the company’s contract with the UMW. The company filed for bankruptcy, and company officials have said reducing health-care benefits for employees is a key part of reorganizing the company’s finances. On Monday, as the head of the column of protesters arrived at their destination, the tail was still at the Civic Center. Their chants drowned out the noontime bells of a nearby church as the crowd stretched for blocks through the heart of downtown Charleston. Once in front of Laidley Tower, where Patriot Coal’s state headquarters are located, Roberts urged the crowd several times to be peaceful, and to direct their anger at Patriot and the company’s lawyers. This is NOT A GRAVE YARD! THESE ARE THE GRAVES STONES THAT USED TO BE ON A MOUNTAIN THAT GOT BLOWN UP in mountain top removal coal mining.